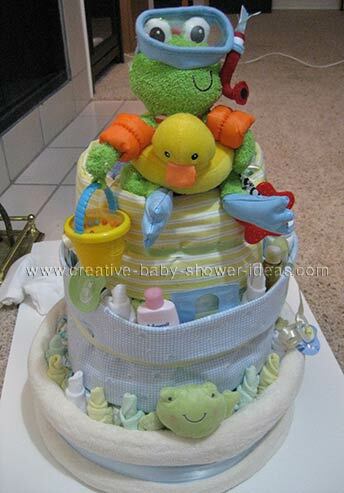 This frog diaper cake gallery is full of ideas shared by our readers. The photos shared will help you as you create your own work of art. You can share your finished phtoos with us here. 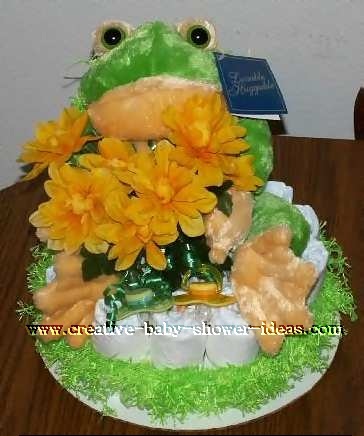 This is a yellow and green frog cake I made for a friend of mine. 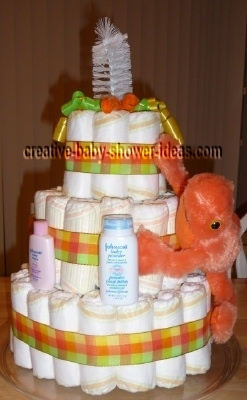 This diaper cake was very easy to make and everyone loved it at the baby shower! 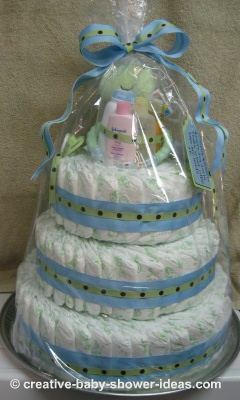 It is made of 1 layer of 21 diapers and a baby bottle in the center for stability. I found this funky green fringe trim at the store and had to use it. It went really cute with the green frog. 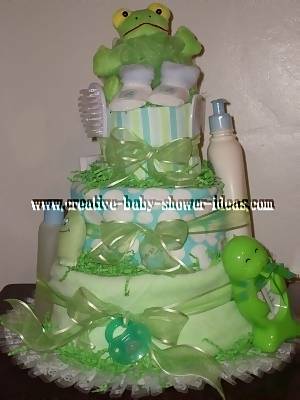 I used white curling ribbon to hold the cake together and green curling ribbon to tie on a green and yellow pacifiers. I added some bright yellow flowers as a finishing touch. 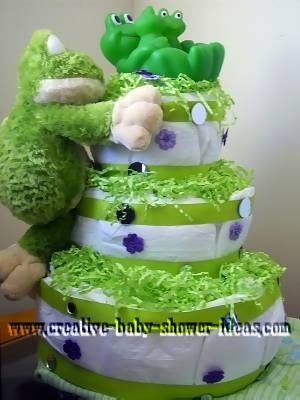 I wanted to do something different for my daughter's baby shower and tried making a frog diaper cake. It worked out well. It was the topic of conversation at the party. First I have to thank you so much for having this site- I found GREAT ideas and instructions here and my cake came out wonderfully and I had such a good time making it! Thank you, thank you, thank you! 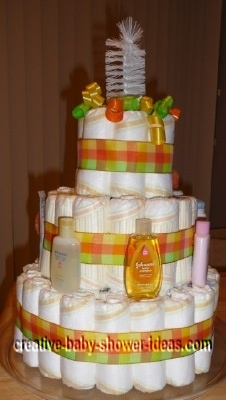 This is my first diaper cake! I made it for my best friend's baby shower- she is having a boy. 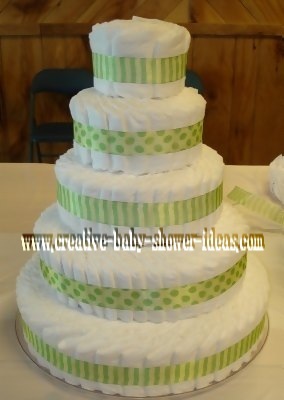 I used 48 size 2-3 Pampers to make the top and bottom layers. The centers of the bottom 2 layers are bottles. The middle layer is a couple of diapers, 1 bottle, 2 newborn gowns, 2 onesies, 1 pack of toddler silverware, 1 travel pack of wipes, a travel bottle of baby lotion and a travel bottle of baby wash. I wrapped the bottom layer with a hooded towel & the top layer with the wash cloth. A frog toy is the topper. The base I cut out of foam board from the craft store- I covered the edge by hot gluing ribbon on it and also glued a layer of tulle to it. This was a great, fun project and my friend loved it! 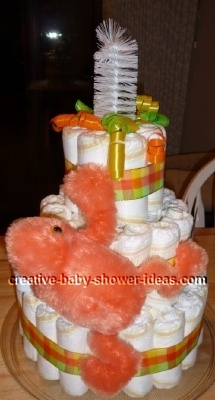 My advice is to pick one thing to "inspire" the cake (I chose the frog towel set from her registry) and then wander through the store or look on her registry to get ideas for other things to put on it- in my case my friend had a shower prior to mine so I knew some things she needed or wanted that she didn't get and included them in the frog diaper cake. Above all, HAVE FUN! 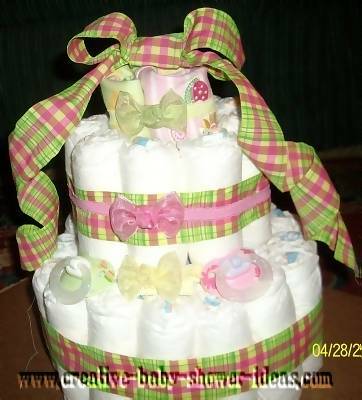 This is my first attempt at a diaper cake. It wasn't as hard as I thought it was going to be. I made it for my daughter. 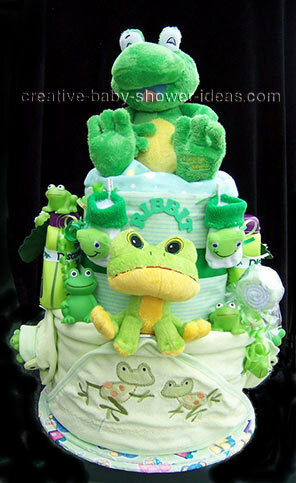 She is expecting July 11th and her nursery theme is frogs. 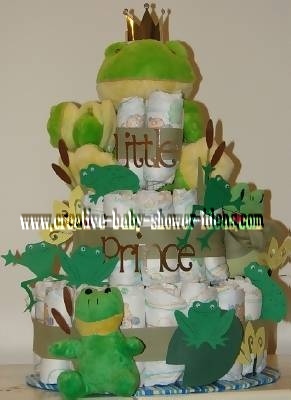 These diapers are decorated with frog accented items. I made this for my sister in-law. 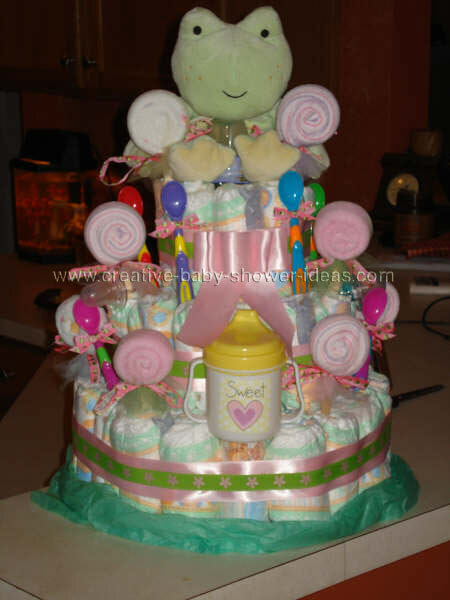 It was my first attempt at a diaper cake and I'm really happy with the way it turned out! 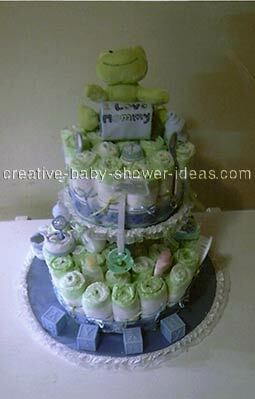 The cake is made up of 40 newborn size diapers, 3 bottles (one is in the center for support), baby washcloths, travel sized baby powder, shampoo and lotion, bib, booties and stuffed frog. Oh! Also, the diapers have little frogs and bugs printed on them. Such a lucky coincidence! 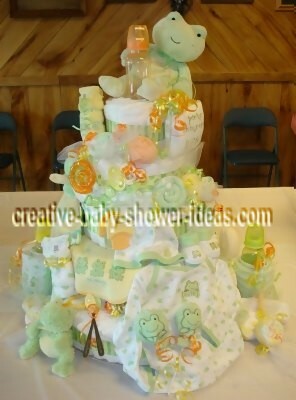 I hosted a frog-themed baby shower for my cousin and wanted to make a diaper cake as the center piece. It was a huge hit, and the mom-to-be loved it! 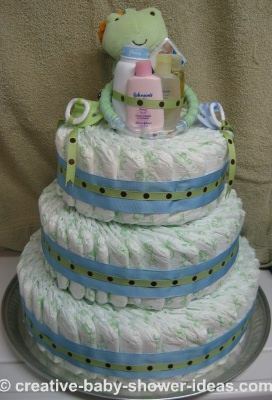 I decided to make the swirl-type cake where the diapers are laid long-ways on their sides, and are not individually rolled. I thought this type looked like it would take less time to assemble and disassemble. I ended up with a pretty substantial cake â€“ 16 inches wide at the base and five tiers tall â€“ and it was decorated all around, not just on the front. I pre-assembled the cake layers and decorated it right before the shower. I started by setting out the platter as my base with a hat box as a center support (also to hold the extra items not used to decorate the outside). I cut the height of the hat box down to 1/4 inch less than the height of a sideways diaper. I then cut strips of poster board and taped them together in a ring just smaller than the size of the platter. I constructed the first layer of diapers using the space between the poster board and the hat box as a mold. When I had the diapers spaced evenly; I took a length of ribbon and tied it around the layer, then pulled out the poster board. 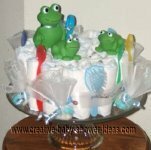 I used the various sizes of hat b ox lids as molds to hold the diapers as I arranged them in the swirl pattern, and tied them with ribbon to hold them together. I made each layer about 4 inches smaller than the last layer. This gave me about 2 inches around each layer to decorate, and for each layer I alternated the direction of the swirls. For the top layer I used a baby bottle set on top of a rolled up burp rag as a center support. Using lengths of curling ribbon and various size lengths of lollipop sticks, I attached all of the frosting decorations. I rolled up some of the Onesies and tied them with curling ribbons, so their designs would show, and anchored them with lollipop sticks. These fit nicely between the diapers without tearing or snagging them. The other Onesies I secured with the plastic teething rings. I rolled the washcloths diagonally and shaped them into a pinwheel, then wrapped them in tulle netting to resemble wrapped candies. I also wrapped a few of them along with a stick to resemble actual lollipops. For both the candies and lollipops, I used curling ribbon to secure the netting. I folded the receiving blankets into fourths lengthwise and wrapped each around a baby bottle, using a corsage pin to secure it. I set these on either side of the cake. Other items were simply draped or set onto the cake without any pinning or tape. It was very easy to take apart (sadly, less than 5 minutes!) I hope the hat box idea is helpful for others, and certainly the size of the cake and amount of decorations can be customized to your needs. Have fun!! My neighbor had already purchased a number of "frog" items for her baby boy. When I saw this frog, it was wrapped around a blanket. It was perfect for what I wanted to do for the shower. 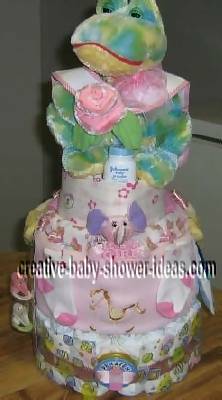 I just wanted to share my diaper cake experience. Number one don't worry about finding clear rubber bands, any will do. I used regular ones and then covered them with ribbon so you couldn't see them anyway. Second I was racking my brain trying to figure out what I could use for the center support base and ended up using candles. They are cheap, sturdy and come in lots of different sizes. 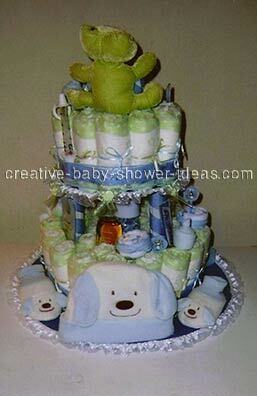 Plus if the mom wants to take the cake apart to use the diapers later she can use the candles too! 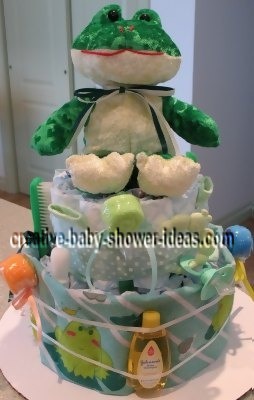 I made this diaper cake for a friend's shower. It was a pink and green frog theme. 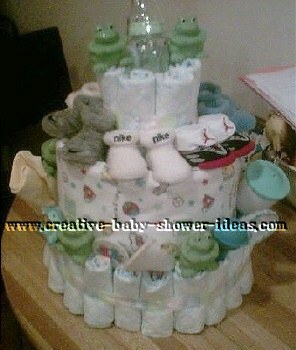 This was my first diaper cake, and I'm looking forward to doing more!! 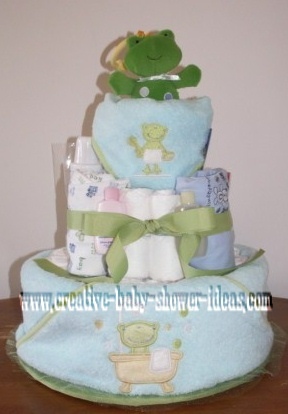 - WRAPPING TIERS Bottom tier with frog hooded towel. Try to make it so that the frogs are facing outwards. Top Tier with the receiving blanket. - 12" FROG- Using two pieces of string and thread one side of each string through the strings used for the tiers. Tie each leg of the frog separately. - BURP PAD- Tuck under frog topper. Then tuck the sides of the burp pad between the receiving blanket and rolled diapers. - 1 1/2" RIBBON- Wrap around the top tier. Dab hot glue and join the two sides of ribbon together. - 5" FROG- Sit it directly under the topper frog on the ledge. Apply 2-sided tape to the bottom and back of the 5" frog press it into place. - SOCK RATTLES- Using white clothes pins clip the socks on the receiving blanket on both sides of the 5" frog (not touching). 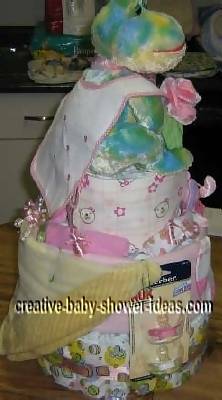 - BOOTIES- Using the hooded towel as a visual aid, use the mini clothes pins and clip them above the corner of the hooded towel (both sides). - 5/8" RIBBON- Wrap around the Kandoo bottles when the ends meet give an extra cm. dab glue and join the two sides of ribbon together. (Do this to all bottles). - SECURING KANDOO BOTTLES- After attatching the 5/8" ribbon, eye it to see if both ribbons 1 1/2" and 5/8" meet when the bottle is resting on the ledge. (Adjust accordingly). Make a small hot glue line on the bottle and press it against the green ribbon. Hold it there until dry. - ATTACHING ONESIE- Fold and roll frog onesie making sure the frog symbol is facing forward. Place elastic on both sides. Add two different green colored curl ribbon to both sides and curl. Feed a piece of string through the ribbons (both sides), pull up one diaper from the middle of the tier (only high enough you can put your fingers in) feed string though the elastic, and tie the strings together. Replace diaper and the onesie will fall into place. 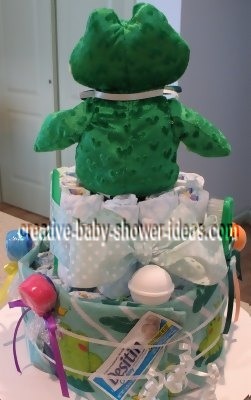 - BOBBLE HEAD FROG- Place a piece of 2-sided tape; enough to cover the bottom of the frog, and press it into place on the ledge of the tiers (back of the diaper cake). - LILY PAD- (Found at craft store). Take small dowel. Cut into a 7" length. Sand both sides till smooth. Take one lily pad, apply hot glue to the top of the dowel, press it to the back center of the lily pad, and hold until dry. Take a crouching frog, cut enough 2 -side tape to cover the bottom of frog, press into the middle-top of lily pad. Finally, take the dark green wash cloth, starting at the 4" mark start wrapping the dowel until you get to the base of the lily pad. Take several small elastics and randomly secure the wash cloth. 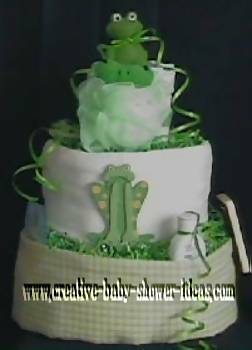 (Remember lily pad markings are not perfect therefore, try not to place elastics straight) Then stick lily pad on both sides of the cake facing forward. - LOLLIPOP- Cut clear cellophane approx 12" x 8" (better to have more than less), have elastic nearby and green curling ribbon. Take white wash cloth fold it into four, do the same with the light green wash cloth. Roll not to tight yet not too loose the white wash cloth. Apply two small elastics on the outside of the white washcloths to hold it into place. (You will notice that there is a neat side and a not so neat side) place the rolled wash cloth at the end of the light green wash cloth (good side joining the good side of the green wash cloth) Roll the two together. (Hold) Take spoon place it on the back of not-so-neat side. Using 4 elastics cross elastics around the wash cloth and over the back of the spoon till the spoon is secured. Pick up cellophane, place wash cloth/spoon in middle of cellophane, gather rest of cellophane at the bottom of the wash cloth, secure with elastic, and decorate with curling ribbon. Place in front area to the right. - RUBBER FROGS- Take two and put them in with the booties looking out. Rest put two sided tape on and place them randomly on the cake. 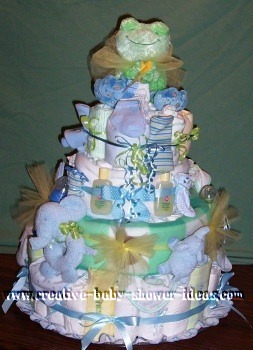 I made this diaper cake for my youngest daughter's baby shower her first child who is a boy. I made it with a friend. Everyone at the shower loved it. I have received two orders since the shower 9-6-08 I am very pleased with the outcome. 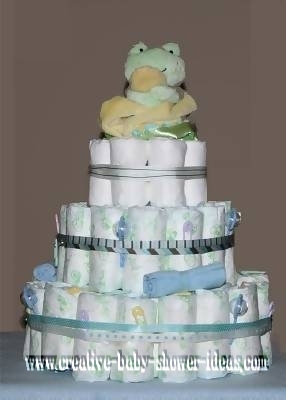 I looked over some ideas for Diaper cakes and came up with this one. It was a lot of fun to make. I make these and sell them for others to give!! 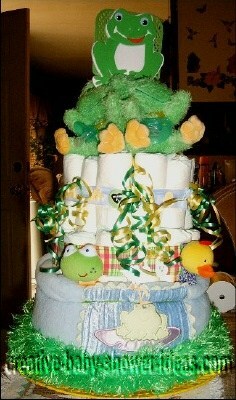 This is my 1st diaper cake. I made for a friend. The theme was frogs, but we were having a lot of trouble finding things with frogs on them. So we ended up just doing everything in pink & green. 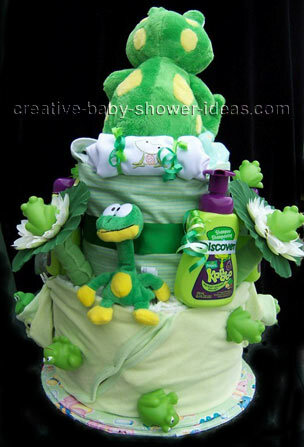 Here is my 1st Frog diaper cake. It has 116 size 1 diapers and on the inside of the bottom layer are 1 bottle Johnson's lotion, 1 bottle Johnson's powder, and 1 bottle Johnson's baby wash. 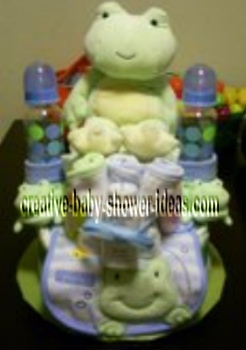 The cake also includes a plush rattle frog toy, sample size lotions and 2 pacifiers. 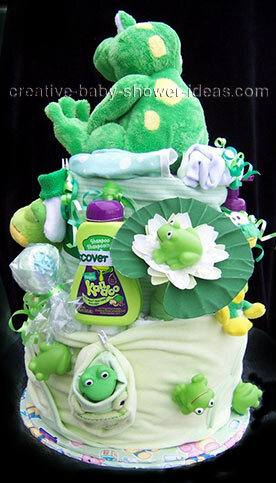 Since I don't like a lot of items all over the cake I included a matching frog gift basket to go along with more bath items, baby wipes, a frog hooded towel, and frog pajamas inside for the new mom.